THIS is an unflinching and courageous insight into Darren McGarvey’s personal life and the social conditions which crushed him, until an epiphany led to a radical change in his outlook and approach. Growing up in Pollok, the south-west Glasgow housing estate where physical and verbal violence was the norm – and where debt was incurred by “acting like we had more money than we did” because the price of looking poor “was always far higher” – is an experience, McGarvey says, that is very rarely represented, reported and discussed. His direct connection to this life means that he’s been involved in numerous BBC documentaries but, when he tried to bring a class perspective to bear in them, it was made clear that being descriptive of the symptoms was fine but analysis or even being prescriptive is not what was required. The need to tackle this outlook, so that working-class life is represented and acted upon, is one of the motives for, and lessons in, the book . But remedial action cannot take the patriarchal form it did previously, where decision-makers , excluding the community, decided what is good for local people. An example is the failed tower blocks named A, B and C by the planners and ironically dubbed Alcatraz, Barlinnie and Carstairs by residents and locals. Political participation, McGarvey says, was not about the community making its voice heard but corralling the herd to a pre-determined destination behind closed doors. Pollok Country Park – gifted to Glasgow to remain open-space woodland – has the M77 motorway running through it, dividing the community, and leading to the Silverburn shopping centre being built there. 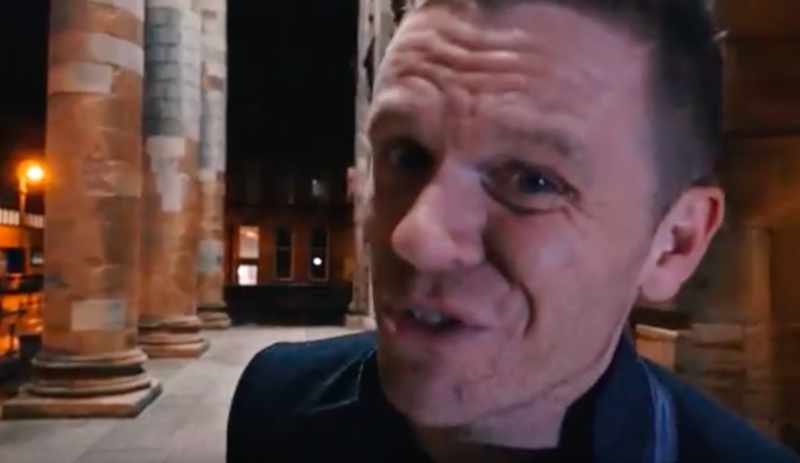 McGarvey’s anger about poverty and class sees him heading up an angry mob whose object of ire was the artist Ellie Harrison and her project The Glasgow Effect. His impulse, angry and violent, lacked any comprehension of even the most basic facts of the matter. The title of the book comes from his dismissive, knee-jerk description of Ellie Harrison’s Creative Scotland-funded year living within the confines of Glasgow. It was, he said, a ‘poverty safari’. That’s a technique refined in Scotland during the 2014 referendum campaign and deployed against predictable targets since, including McGarvey himself. He confesses that his urge for retribution was so strong that it blinded him to the fact he and the artist were fighting for the same thing. Breaking the cycle of his old ways by being a responsible parent is “the most practical way of transforming my community,” a lesson that a lot of men – and it is mostly men – need to learn if communities like Pollok are to change on their own terms, not those set by others. As the author says: “Those who shape the discussion about poverty often lack the necessary insight to accurately represent the issue,” but McGarvey does this with great honesty, humour and perception. “Class, above all, remains the primary dividing line in our society. In truth, it’s less a line and more an industrial-scale wound,” he declares, and such comments make this a book that should be required reading for all those engaged in the fight against poverty. Buy it. Discuss it. Act on its insights. Gordon Munro is Labour councillor for Leith Ward, stood as Labour candidate for Edinburgh North and Leith in the 2017 general election and is a member of the Scottish Poetry Library.